Dr. Vamvoudakis' research is multi-disciplinary and draws from the areas of control theory, game theory, renewable energy (smart grid) and computational intelligence. Interactions between self-interested agents along with nature-inspired approaches, are used to design and develop control system algorithms with guaranteed performance and stability where traditional techniques are unable to provide any solutions. His current research focus is game theory based network security and multi-agent optimization with applications to cyber-physical systems. Paper on “Optimal and Autonomous Control Using Reinforcement Learning: A Survey,” is listed as a 2018 Publication Spotlight of the IEEE Computational Intelligence Society. Paper recognized as one of the 2018 Google Scholar Classic Papers in the area of Automation and Control Theory. From left: Dr. K. G. Vamvoudakis of Georgia Tech, Dr. A. Minai, President INNS. 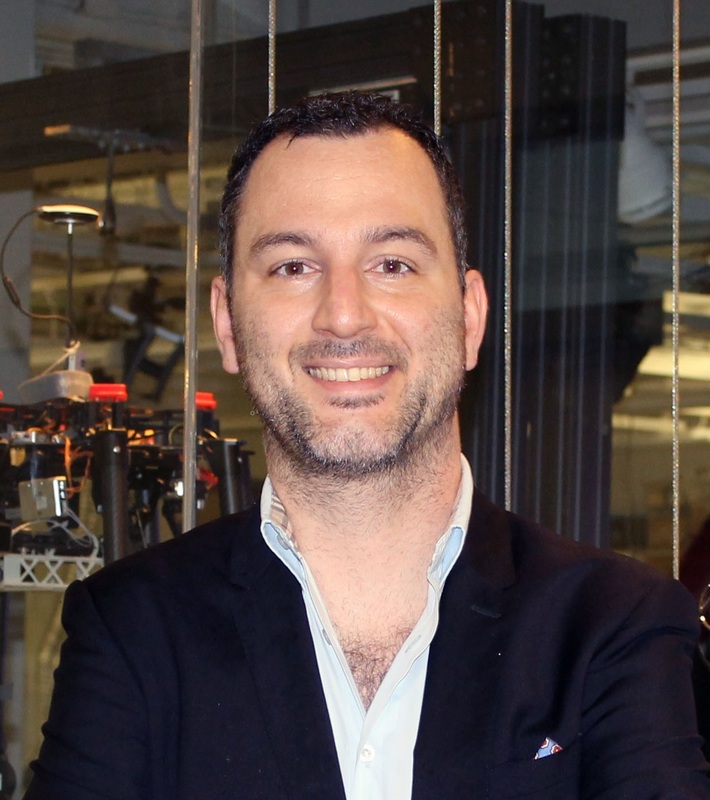 Dr. Vamvoudakis was named CCDC Researcher of the Spring Quarter 2017. Dr. Vamvoudakis has been elected on November 2015, to the grade of Senior Member of IEEE in recognition of his professional standing. 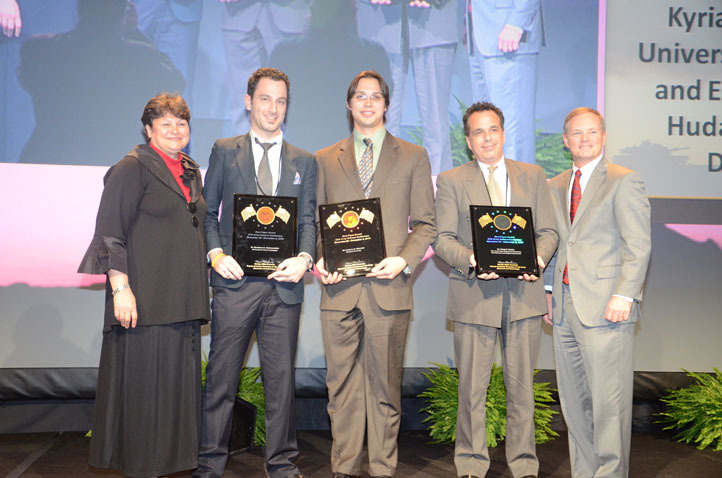 Dr. Vamvoudakis was awarded U.S. Patent rights (along with F. L. Lewis and D. Vrabie) on July 2015, for his invention titled “Optimal Online Adaptive Controller” (US Patent Number 9,134,707). Please see the public releases at eurekalert.org, phys.org, techradar.com, endadget.com, msn.com, engineersaustralia.org.au, theshorthorn.com and humanoids.io. 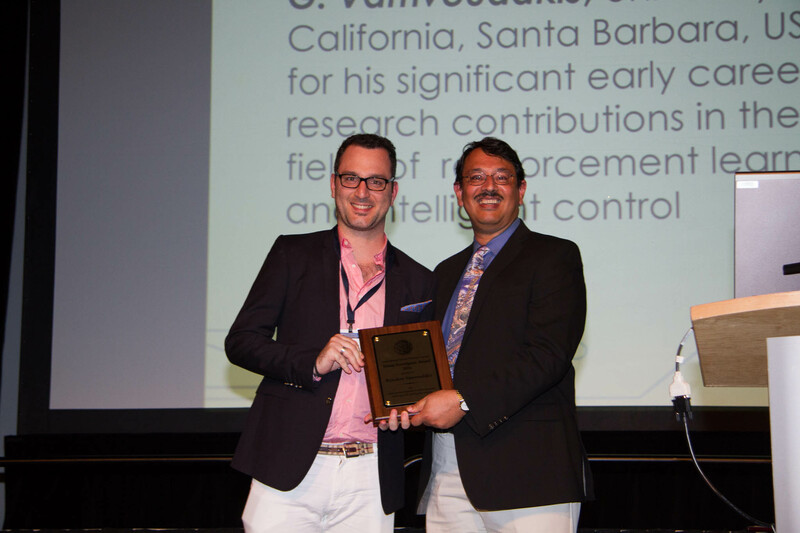 Dr. Vamvoudakis received the Best Paper Award at the 2010 Army Science Conference with the citation “Award-Winning Research Keeps Soldiers Safe, Effective”.